Star Shower® Laser Magic® | Official Site | Create A Laser Light Show For The Holidays! Star Shower® Laser Magic® Makes Any Home Sparkle Outside! You Will Love These Lights! The moving images are so bright and clear. It really brings the holidays to life! Now you can choose between the classic laser show or awesome new festive images. It's great! Stop struggling with holiday string lights year after year. You spend all that time hanging them just to find out they don't work anymore. 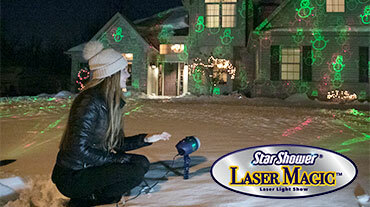 Star Shower® Laser Magic® is the all new home laser light that projects brilliant holiday pictures in magic motion. READ FULL DESCRIPTION It's the next generation of laser lighting. Star Shower® Laser Magic® features 6 fun and festive images that everyone will love. Set up is easy. Place in your desired location and plug it in - one light, one plug! You'll get instant red and green bright images dancing on your home. Pause or play your laser light show with a press of the motion button. Still or moving, close or wide, Star Shower® Laser Magic® makes any house sparkle outside! The laser lights cover a surface of up to 3,200 square feet. Plus, Star Shower® Laser Magic® is energy efficient. You'll use 99% less energy than using traditional string lights. Bring the festivities indoors as well by using the included indoor base. Perfect for parties, apartments, basements, or wherever you need a little holiday cheer. Be the most brilliant house on the block with Star Shower® Laser Magic®! Order your Star Shower Laser® Magic™ for only $39.99 plus $9.99 shipping and handling. Your purchase also includes an extra-long stake for oudoor use, and indoor base and 6 laser images! But wait! Double your order and we'll send you a second Star Shower® Laser Magic® set. Just pay a separate fee of $19.99. Laser Magic Can Transform The Inside and Outside of Your House in Just Seconds! With Only 1 bulb & 1 plug, Laser Magic is up to 99% more energy efficient then other holiday lights! With Laser Magic You Can Cover Over 3200 Square Feet With A Single Light. Laser Magic offers 6 images that you can choose to display as ALL green OR Green & Red! OFFER: Order your Star Shower Laser Magic for only $39.99 plus $9.99 shipping and handling. Your purchase also includes an extra-long stake for outdoor use, and indoor base and 6 laser images! But wait! Double your order and we'll send you a second Star Shower Laser Magic set. Just pay a separate fee of $19.99. UPGRADE to the Star Shower Laser Magic Deluxe Offer and receive the Star Shower Laser Magic, 6 laser images, extra-long stake, indoor base, AND the wireless remote so you can control your Star Shower Laser Magic from anywhere inside your home - Yours for only $59.98 plus $9.99 shipping and handling. Double your deluxe offer and just pay a separate fee of $39.98 plus $9.99 shipping and handling. Order now! GUARANTEE: Your satisfaction is 100% guaranteed. If you are dissatisfied with your Star Shower Laser Magic for any reason, simply return the product within 30 days for an easy refund of your purchase price, excluding shipping and handling. See our return policy for more information. Exceptions may apply. Decorate Your Home With Festive Images By Ordering Above! Check out these other great products by Star Shower® Laser Magic® . TEXT FOR OTHER PRODUCT OFFERS. Hear from other Star Shower® Laser Magic® customers how much they love it, and why you will too! Check out all the news for Star Shower and its creators at TeleBrands featured all over the world.